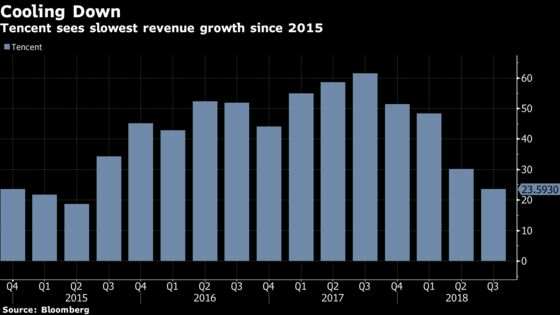 (Bloomberg) -- Tencent Holdings Ltd. is planning to clear out about 10 percent of its existing managers to make room for younger executives as China’s largest gaming and social media company confronts a slowdown in growth, according to people familiar with the matter. President Martin Lau told an internal meeting late last year that its lowest-performing general managers will need to leave the company or be demoted, mainly because not much staff-pruning has occurred in the past, the people said, asking not to be identified talking about a private matter. Tencent may then promote star performers, one of the people said. Jane Yip, a spokeswoman for the company, declined to comment. The move comes as Tencent climbs out of one of its deepest troughs. Chinese regulators froze gaming approvals for nine months in 2018, walloping the company’s bread-and-butter business. The world’s eighth most valuable company is also fending off competition from Alibaba Group Holding Ltd. and newcomers like Bytedance Ltd., which is siphoning user attention with short video apps. Tencent asked marketing executives in its core gaming division to curtail spending to weather the approvals drought. The social media giant is scheduled to report earnings Thursday with analysts forecasting a 16 percent drop in net income in the December quarter. That would be the largest decline in at least a decade. Tencent’s workforce has ballooned to more than 50,000 as of September, from just over 30,000 at the end of 2015. It now follows a slew of Chinese tech companies from JD.com Inc. to ride hailing Didi Chuxing that’re shaking up their ranks to tide them over during tougher times. Funding has shrunk alongside a cooling in the nation’s economy, the world’s second largest. That’s exacerbated by trade tensions with the U.S. and regulatory clampdowns that fomented uncertainty and spooked would-be investors. Chinese venture capital deals in the December quarter were down 25 percent and at their lowest since 2015, according to market research firm Preqin. Tencent itself still commands a powerful asset in WeChat: a mash-up of WhatsApp, Instagram, Facebook, Yelp, Paypal and Twitter used by more than a billion people to shop, pay for services and hail rides. That’s a massive population of longer-term consumers not just for games and ads but also fledgling services from video to financial services. Yet WeChat founder Allen Zhang has said the platform needed rejuvenation and in January laid out his vision for how it should evolve.